So it was that over the fall emissaries went out in teams of two. They went among all the Dakota bands, and the Cheyenne, and the Arapaho, and spent the winter convincing their hosts to join in the grand venture of moving into the vast rich lands of their enemies, the Absarokee. By the end of spring, there assembled at the fork of what became Goose Creek a massive campsite. Eight to ten thousand warriors were there with their women and children. It was the largest gathering of tribes – before or since. Sitting Bull could not gather so many for his great battle at the Little Bighorn sixteen years later. The war chiefs of the allies made council. It was time to delay no longer. Scouts had reported that perhaps four hundred lodges of Ravens – no more than twelve hundred warriors at best – were camped only a half-day’s ride to the north, but were on the move. It was realised that they had probably seen the big camp at Goose Creek and guessed at what was to come. One by one the war chiefs spoke about the battle to come. This was not to be war as it had been fought between tribes before – a sport of wits, bravery, skill and honour. This was to be the wiping out of the Raven People – the killing of their men, the taking of their women and the adoption of their children into the conquering tribes. Eventually a tall Arapaho chief stood and looked solemnly around the council. Night Horse was well respected, but he could not sway the council from the path they had chosen. That night the Arapaho chief broke camp with a few of his people, and headed southwest, unmolested by any of the great assemblage. As they rode, Night Horse dispatched two of his sons to quickly and carefully ride to warn the Absarokee camp of the great war planned against them. The Ravens had headed west from their earlier encampment, and were more than a day’s normal ride clear when Night Horse’s sons found them. Threatening Absarokee warriors immediately surrounded the two newcomers. But when one son, speaking the tongue of the Ravens, identified himself and his father they were escorted to the lodge of the head chief. There they passed on their father’s advice – that the small camp of Ravens should go as quickly as they could, and join up with others of their people. Some counseled the head chief to ignore the two young men. But a wise elder named Talks With Trees spoke up. Talks With Trees’ wise counsel prevailed. Horses were packed and tepees hurriedly taken down, and quickly the Absarokee were on their way. They crossed the Bighorn River and made camp on its western side, intending to head for the interior of Raven country where there was a large Mountain Raven camp. In the early hours of the morning, before the sun had broken the horizon and there was barely enough light for a man to just see the lines on his palm, the Ravens again made a rapid departure, riding hard further westward. As they rode, they left behind a small party of men to watch their enemies, then ride back and report throughout the day. Three of that little band lay on a ridge as the sun came up, watching the huge camp burst into a hive of activity. Rainbows End nudged the arm of Grey Hair beside him. Grey Hair shook his head, but Sings Like Water edged forward and listened intently. The allies were massing, the men all armed with an array of guns, bows, spears and tomahawks. The chief had climbed onto a large flat rock and was crying out in a shrill voice. His face losing colour, Sings Like Water translated. The first Dakota warriors rode off to where the Ravens had been camped on the bank of the Bighorn. They found the campfires still smoldering, but no other sign of life. Angrily, feeling cheated of their prey, they headed back towards their main group to report. The three scouts who’d been on the ridge had the misfortune to encounter a number of outriders at the edge of the war party. The Sioux outriders had noticed the three tethered horses and were cautiously approaching just as the Absarokee trio broke cover. A coup stick crashed against the skull of Rainbows End and he landed heavily against the trunk of a tree. His horse reared, blocking the path of the Sioux momentarily. Grey Horse looked back at his fallen friend even as he scrambled onto his own mount. Although blood streamed from the wound to his head, Rainbows End was still breathing and his eyes were open. There was no light in those eyes, though. With a shudder, Grey Hair slapped his horse’s rump and charged after Sings Like Water through a narrow gap in the trees. A spear thrust finished Rainbows End’s luckless horse. The Dakota riders vaulted the dying steed and gave chase but the two Ravens knew the trail, and were able to make good their escape. Grey Hair knew he would forever be haunted by the blank stare from the eyes of Rainbows End, and he cursed himself for not having the chance to spare his friend from meeting his final end helplessly at the hands of an enemy. He would have been astonished, as the Sioux party was, to return to the little clearing where the horses had been tethered and find that the apparently stricken Raven had vanished. The corpse of his horse lay where it had fallen. With some concerned mutterings the outriders of the advance party rejoined their tribesmen. On hearing the news of the Absarokees’ flight the Dakotas army made haste to pursue en masse. But the head start proved impossible to overcome. And such a large force would always be more difficult to manage cohesively than a smaller more compact unit. Despite the Dakota chief’s boast, by sunset the hard-riding Sacred Ravens had travelled fifty miles and were still very much alive. The pursuers would have to wait another day to do what they had set out to accomplish. Late in the day Grey Hair and Sings Like Water had managed to catch up with the tribe, as had most of the others who had been left along the trail as rear guard sentries. They stopped and set up camp for the night on the far side of a fast running stream that later would be named Pryor Creek. There was an open flat area fringing the creek, surrounded by thickly forested slopes. The eastern side of the creek rose sharply into the first of a number of hills, overlooked by an escarpment that loomed over them all. The hills and gullies had given the smaller Raven party an advantage in mobility over the far greater numbers of their foes. It was dark when a lone figure rode silently into the Raven camp on a black stallion. A startled sentry first saw him when he swung down from what was obviously by its trappings a Cheyenne horse. “Captured,” was all the new arrival said, indicating his panting mount. The sentry nodded. Obviously one of the rear guards who’d had a lucky escape. Yes, he did look somewhat familiar, even in the darkness. The newcomer strode to the tepee where the war chiefs had gathered to make plans for the next day’s flight. The chiefs looked at him. An outcast from the Mountain tribe perhaps? He spoke the Raven tongue flawlessly, and he looked familiar, although he wore war paint of a style none had seen before. “If you would fight with us, you are welcome, Gift Of The First Maker. Especially if you know these trails well!” said the high chief, over the mutterings of some of his council. “I would, and I do,” was the short reply. A light of recognition dawned on one of the chiefs. The chief who spoke rose and took a pace towards Gift Of The First Maker, then stopped, finding himself unable to meet the other man’s gaze. The old chief folded his arms and sighed his agreement. At his casual advice of the nearness of their enemies several of the council looked nervously at each other. The new man continued. He went on to explain a strategy that left some chiefs open-mouthed with surprise, others muttering with misgivings, but others, including the old high chief, smiling at its bravery and audacity. Well before the rising of the sun the Absarokee were hard at work, busy but as near to silent as they could be. Tepees were dismantled, their poles and hides used to construct a fortress of sorts at the fringe of the forest. Rocks and logs were arranged in the clearing and at points along the edge of the surrounding trees. Horses and riders were prepared along narrow forest trails that they could dash in and out of quickly. Not all of the Absarokee understood what they were doing – indeed, probably few of them had any clear idea of what lay ahead, but they followed the high chief’s orders loyally. At early dawn, one of the warriors who had worked hard throughout the night then sought a little sleep before the day’s exertions woke with a start. His name was Hits Himself Over The Head, and not for the first time in his life he felt like living up to his title. He had failed to tie up his horse properly before putting his head down, and the mare had slipped its tether and wandered off as the man slept. Hits Himself Over The Head may not have been the brightest man in the Raven tribe, but he was an excellent tracker. Even in the meagre light, he quickly determined that his horse had ambled off toward the creek. Failing to find the animal, and mumbling a contrite apology to fellow tribesmen he passed, he quietly made his way across the stream and up the opposite slope. Moments later, he was prepared to smack himself across the brow again. Down the hill was a seething mass of men and horses. It was a scene of busy and determined activity. Warhorses were being readied, battle regalia was being put on – clearly an attack was imminent. Hits Himself Over The Head ducked, turned, and bolted back the way he’d come. He almost skidded into the gathered group of his own war chiefs and babbled his report. The high chief nodded, and waved an authoritative hand. The chiefs all began to move to their agreed positions as the old man’s deep voice carried behind them. The women put the final touches to the ‘fortress’ where they sheltered. Men set up their battle lines on the clearing and at the edge of the forest. Riders mounted their horses and waited, ready for their call to action. Ten of the bravest assembled at the edge of the stream. Grey Hair cast an awkward glance at the rider beside him. Beneath the unfamiliar war paint the man looked like Rainbows End, but no, those were not the eyes he’d seen staring blankly a day before. These were eyes unlike any he’d ever seen before. At a gesture from Gift Of The First Maker, the ten charged across the creek and up the slope beyond. They crested the hill and careened into the throng still arranging themselves on the other side. They whooped and fired and swung their weapons, just as in a traditional tribal skirmish, apparently oblivious to the outrageous odds they faced. Several Sioux warriors fell, and there was confusion as the Absarokee men swept across the front line in a shallow, deadly swathe before dashing just as quickly back up and over the hill. With a roar the Dakota gathered themselves and charged after them, led by a warrior named Brave Wolf, who rode a dark roan horse. He was a young man who had been among the first to cry out for the blood of the Ravens, taking an oath to die fighting for his people. As the charging horde approached the creek they automatically tried to slow the mad momentum of their descent as best they could. All of them except Brave Wolf. The Ravens had carefully assessed exactly where best to ford the stream and did so at full speed. Even so, Brave Wolf, in hot pursuit, had nearly managed to catch up with the trailing rider – the mysterious Gift Of The First Maker. The stranger half turned in his saddle and appeared to fling something behind him – something that glittered sharply even in the weak dawn light. Brave Wolf’s horse reared and tried to turn back. As the Dakota youth struggled with his startled mount, a Raven noted for his accuracy with a bow stood and sent an arrow into the would-be hero. As Brave Wolf tumbled to the ground one of the Raven mounted warriors dashed from the trees, leapt from his own horse and swiftly scalped his fallen foe. With a triumphant whoop he brandished his grisly trophy at the Sioux, gesturing to indicate he’d add many more to his collection this day! At the very front of the Absarokee ‘fortress’ an older woman climbed onto a small platform. She was White Bird Of The Night – the storyteller of the Sacred Raven people. She raised her arms to the rising sun, looked out over the massed force opposing her tribe, and cried out in a loud voice. Between the defiance of the horseman and the supernatural threats of the woman, which many understood at least in part, the reserve of the Dakotas and their allies broke. This would be the day, the long-awaited day, when the Absarokee would be annihilated! Wave after wave of men, numbering in the thousands, thundered down the steep slope. A few fell, and were crushed under the hooves and heels of those who followed. As they struggled across the creek and charged the Absarokee let fly from the defensive positions they’d prepared. Spearmen and archers in the front line of the clearing had clear front-on targets as their enemies ran at them. Set wider the best of the Raven marksmen took deadly toll with concerted fire of guns and bows. Quickly the Dakotas, Cheyenne and Arapaho regrouped and made another charge. Again they suffered heavily casualties without severely denting the Absarokee lines. When this happened several times, the ferocity of the attacks began to diminish. This was not what had been expected! Then a party of the Ravens broke from their defensive positions and made their own charge, cutting into the allied force backing up over the eastern hillside. A lull fell on the battlefield. The Dakota women who had ridden with their warriors stopped singing their shrill songs of encouragement and premature cries of inevitable victory. The Raven people waited and watched and wondered. Gift Of The First Maker suddenly rode out again, but at a sedate canter. His horse trotted across the clearing and the creek, and up the opposing slope, picking his way among the fallen. As he rode he made signs that he offered no threat, only had something to say. Puzzled and by now unnerved, the Dakota forces let him approach and stop at the crest of the hill. He looked about solemnly and spoke. Later, Sioux witnesses said he spoke in their language. Ravens swore it was in their tongue. Perhaps he used both. With that, he wheeled and rode swiftly, not back to his comrades over the creek but along the line of the steep hill and into the woods to the southwest. In their defensive lines, the Ravens looked at each other in bafflement, even the chiefs. Others? What others? They hadn’t been able to reach their mountain kinsfolk – there would be no others to fight with them! This was the boldest of bluffs, surely! From the high escarpment on the eastern side of the creek, a Sioux lookout shouted suddenly. He pointed to the north, waved frantically and called that a large war party was coming up the creek! The truth was that at that moment a large herd of elk, excited by the noises of the fighting, had started to mill around realizing they were approaching a place of great danger. Their sharp hooves raised a swirling cloud of dust, within which their barely glimpsed white rumps looked like war bonnets! Barely had the shock of the news of the first supporting army hit the Dakota forces when a lookout at another part of the escarpment cried out. Another war party could be seen approaching rapidly from the west! It was clear – nobody could miss the huge cloud of dust coming towards the battleground. What was not clear was that at the heart of the dust cloud was a herd of stampeding buffalo frightened by the noise of battle echoing down the valley they’d been grazing in. Groups of Dakota warriors milled around in anxiety. The Sioux war chiefs called a hurried council to plan their next move. A few of the more respected chiefs were sent to move among the warriors, reassuring and encouraging them. Meanwhile, Gift Of The First Maker had halted his ride. Before meeting up with the tiny force of Absarokees ‘shock troopers’ he had arranged to be in readiness along this trail, he wanted to add to the effect. He crushed some berries and flowers to produce other colours – all shades of deep blue and purple, made a paste with his own saliva and smeared it onto his face in a new pattern of war paint. He was about to remove the light buckskin vest he wore and paint his torso, when a branch snapped behind him and he whirled. Beneath a low branch stood a small dark figure. The man couldn’t have been more than four foot tall. His skin was neither red nor black, but a deep brown. “I have something better,” said the little man, in a language that Gift Of The First Maker recognised but couldn’t identify. “Who are you?” asked the Raven, not in fear but in puzzlement. “A friend,” was the simple reply. Something like a smile played on the purple-painted face. The dark man smiled in return. He handed the bemused warrior a jerkin. It was made of a fine chain mail – tiny circles of iron meshed tightly into a garment surprisingly lighter and suppler than it looked. Gift Of The First Maker looked at the rock being indicated. Large but probably liftable, even though its position among a tumble of other boulders didn’t make that obvious. Then he looked again at his peculiar benefactor. “As do many others,” agreed the small fellow. The larger man nodded. No more, it seemed, needed to be said about the matter, other than thanks for the chain mail. He slipped the jerkin over his head. It was, as it had looked, remarkably light. He pulled his buckskin vest back on so the mail was almost invisible. The small man reached into the shadows of the foliage behind him and extracted a long spear, headed with a two-pronged point of strikingly carved elk antler. That brought a laugh from Gift Of The First Maker. The spear was almost twice the height of his new friend. A shrug accompanied the reply, indicating that no offence had been taken. About to reply, the warrior looked up from examining the spear point and realised that the small man had vanished, presumably back into the darkness of the forest. He shrugged. A mystery for another day perhaps. The time spent was not begrudged – far from it, for his new gifts would add greatly to the plan he was already enacting, but now he must really hurry. He’d originally thought to give his horse markings to match his own but there was no time for that now. He tore a small handful of white clay from the ground by the trail, spat to moisten it, and quickly smeared some symbols on the flanks of the black steed. That would have to do. Clutching his new weapon, Gift Of The First Maker clambered onto his horse and dashed along the trail to the meeting point he’d arranged. Back on the eastern side of the creek, the council of Dakota chiefs and their allies decided they must strike quickly before Absarokee reinforcements arrived. As the afternoon shadows grew longer they rallied their troops and had them mount another determined charge, hoping to dislodge the Raven lines before help arrived. Again the defence held, although the casualties were heavy on both sides. A Sioux warrior later described his shock as a lone warrior charged down from the hill, riding a dark horse with white markings on its flanks. He’d charged straight into a cluster of Sioux warriors and was spearing them, left and right. The Sioux described how he and, he was sure, others of his allies stood their ground and fired guns and arrows at the lone figure. But they had no effect! Even as that shock sank in, a half dozen more horsemen came storming down the hill into the Dakota force. They were handpicked fighters, chosen by Gift Of The First Maker for their fearlessness and their particular talent for shooting accurately from horseback. A nightmare figure in his strange purple war paint, seemingly impervious to bullets and arrows, the Raven rider would swiftly circle and return, time and again. His long spear took deadly toll as it jabbed repeatedly. Hadn’t that woman, this very morning, called on Old Man Coyote to come and help them? The attackers’ nerve broke. They started to break into small, confused bands. The Absarokee warriors, seeing this, seized the initiative. They broke from their defensive lines into a full charge. The Sioux, the Cheyenne and the Arapaho gave ground rapidly. Soon they had broken into a full retreat, with every man for himself. They fled, the cry “Kokohay! Kokohay!” ringing in their ears. Several of the Raven riders charged after them, Gift Of The First Maker at their head. Now a rabble, the allies made their way back to where the big camp had first assembled at Goose Creek. There they waited for two or three days, while stragglers and those wounded able to walk or ride managed to catch up. Despite the threat of their own annihilation, the Absarokee had not simply slaughtered any enemy found on the battlefield. The injured were spared, unless their wounds were so severe that it was a mercy to kill them. Some of the Raven chargers continued their pursuit into the night. One of the erstwhile attackers later told his story. When it seemed clear that no more warriors would be returning to the junction of the creek, the great Dakota alliance broke up. The various tribes and bands dispersed back into their own regions. The grand venture to overrun the Raven territory and destroy its residents was over. It would be nearly twenty years before true peace settled among the tribes of the area. By then though, Sioux, Cheyenne and Arapaho would visit Raven settlements and be greeted with respect – and vice versa. 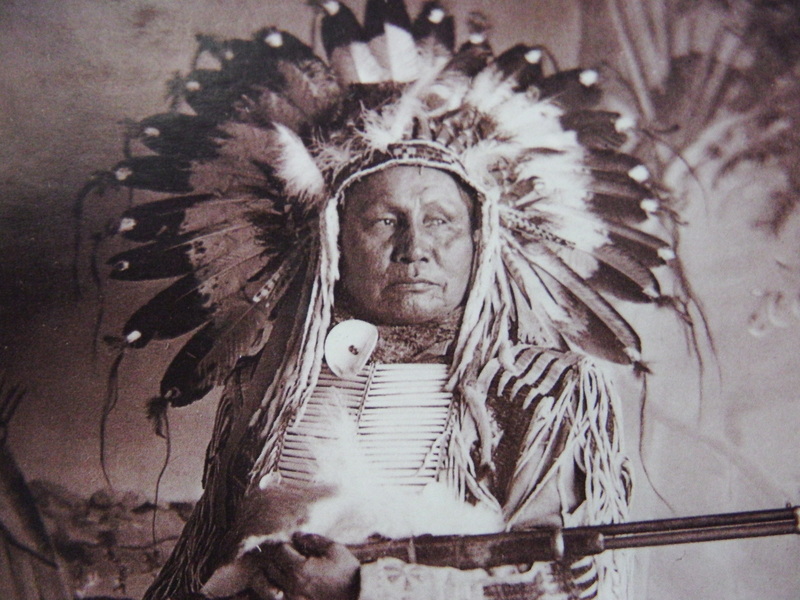 Some of the Dakota guests wanted to know the identity of the ferocious warrior whose invulnerable assault, they said, had almost single-handedly routed the Sioux and Cheyenne. The Ravens never revealed his name. Gift Of The First Maker was never seen again after he rode off after the erstwhile attackers. Presumably the mail jerkin was returned to the Nirumbee, not that anyone knew to look for it. Days later some Raven scouts riding in the area between the Bighorn River and Goose Creek found the body of one of their kinsmen in the shade of a large tree. He looked as though he had simply lain down to sleep and died at the spot. They examined the body – there was a head wound but it had been cleaned well, and was barely visible under the long thick hair of the corpse. As his companions turned over the body Grey Hair trembled. He recognised the face of Rainbows End. White Bird Of The Night lived for many many years more telling the story of the great gathering of the tribes, and the dishonour they had planned. She told the story of Gift Of The First Maker. The others of the tribe never understood quite where he had come from or where he went, so as time passed they didn’t speak much of him ever again, except to offer some quiet thanks. It was White Bird Of The Night’s job though to tell stories. Absarokee stories. Spirit stories. Human stories. All stories that people could learn by – she would tell them. Just as I tell you now.